As a physicist, I have long wondered why any scientist would hesitate to examine data to determine if a theory is right or wrong. Science history is replete with examples of noted scientists taking a stand which delayed research into a vitle area. Yet other lesser known scientists pushed on and demostrated that new data demostrated the wrong stance of the noted individuals. Evolution has long been dominated by those seemingly afraid to look at data. That was possible when it was a science not based on mathematics, but now, the stage is changing. I am eagerly awaiting the new discoveries and what they reveal. I just hope the ones now controlling the literature are replaced with open minded scientists who only seek the truth. That’s the foundation of science; a search for the truth. That is one reason this book is welcome and needed. All young scientists entering these fields should read it. If one takes the time to read through it and check the references. I find it interesting that many of the so-called “reviews” parrot the same message. I wonder if they read the same book as me! I took my time, read through the book, checked some (not all) of the references, and I can’t find where Dr. Meyer distorted or lied about any information. 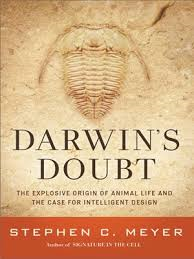 What I do find is an easy to understand, thought provoking, and contrarian view, which is probably what has the evolutionists up in arms. While curious about the Cambrian Explosion myself, and how so many life forms suddenly (relatively speaking) appeared, I had not done research into the topic. Finally, a work that not only explains another possibility, but does so cogently and with a viable alternative to evolution, which now, I find sorely lacking. Thank you Dr. Meyer for your time, effort, and insight! To those who would like to learn about the historical issues surrounding the contemporary debates which revolving around Science and Religion click here ==> Science and Religion. Part 1 of 2 parts, presents the full episode featuring Dr. Meyer and Michael Ruse on PBS’s ThinkTank in 2006. Interested parties can view part 2 off the You Tube site which will present itself at the end of the You Tube below. Click Here and Visit Our ==> Stephen Myer And Hugh Ross Page.